Will my Insurance Cover CPAP? Frequently Asked Questions About Coverage | Advanced Sleep Medicine Services, Inc. If you have a diagnosis of sleep apnea, your insurance company will probably cover the cost of your CPAP or bi-level PAP device; however, coverage varies from plan to plan and so do authorization requirements. Read more about insurance coverage below. We’ll answer the basic questions, like what will I have to pay?, rental vs. purchase and some of the more technical questions, like what are the codes? What is the difference between device rental and purchase? Many insurance companies now pay for PAP devices on a monthly rental basis, typically 3 to 10 months. At the end of this period you will own the device. Because it is a monthly rental, your provider will bill your insurance company monthly. If you have a co-insurance, you will also be billed monthly (to learn more about the difference between co-insurance, co-pay, deductible and more insurance terms, check out our Guide to Understanding Your Health Insurance). How do I know if my insurance pays for rental or purchase? You can either ask your provider or contact your insurance company. When your provider verifies your insurance benefits and coverage they will find out the terms of the rental or purchase and should be able to provide you with an estimate of your expected financial responsibility at the time of set-up and monthly for the term of your rental. Unfortunately, patients and providers have no control over whether CPAP is covered as rental or purchase. How much will I pay for a purchase? If your provider is in-network, they have negotiated rates with your insurance company for your PAP device. There may be a big difference between what you pay if you go with a provider that is in-network rather than one that accepts your insurance, but is not in-network (click here to learn more about the difference and what it means to patients). The cost also varies by type of device. A CPAP or APAP will cost less than a BiPAP or bi-level device (click here to learn more about different types of PAP devices). At the time of your set-up you will also receive a mask, tubing, filters and cushions that will need to be replaced in the future (more about that later). It’s best to speak with your provider or contact your insurance to get the actual price. How much will I pay for a rental? Typically, the rental charges are determined by dividing the purchase price of the device by the number of months in the rental term. Read “How much will I pay for a purchase?” above to learn more about purchase costs. 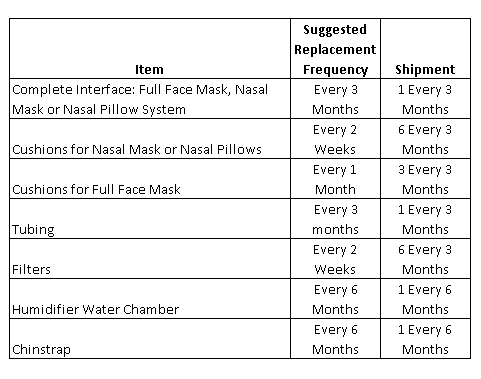 It’s important to remember that your first month’s bill will include the purchase of the mask, tubing, filters and cushions that were provided during your set-up. You will be charged for those items for future rental months, only when you order additional replacement supplies, usually every three months. Will my insurance company require authorization for my CPAP? Many insurance companies, including Medicare and PPO plans, are now requiring authorizations for more and more services, including sleep studies and PAP devices. Many device providers will request authorization from your insurance company, if needed. They will usually require a prescription and your most recent sleep study showing a diagnosis of sleep apnea. If you’re a current CPAP user and are getting a replacement device, you may need a new sleep study. Typically, insurance companies will require a new sleep study every three years. What are the codes for CPAP and supplies? *Due to Medicare regulations, which may be followed by your insurance, your mask kit will be billed using two separate codes. According to your mask type you will find the following combination of codes on your order invoice: either (A7030 & A7035) or (A7034 & A7035). Codes A7034 and A7030 refer to the frame of your mask, while A7035 refers to the headgear. Although they are billed separately they come assembled in the same bag. Why does my insurance require proof of usage? Your insurance company wants to make sure that you are using the device on a regular basis to improve your health. They do not want to pay for a device that you are not using. Therefore, many insurance companies that pay for CPAP on a rental basis are now requiring proof of compliance in order to continue the device rental or before they will purchase the device for you. Most insurance compliance guidelines require that you show proof of using your device for a minimum of 4 hours per day at least 22 days out of a consecutive 30 day period within the preceding 90 days (in the past 3 months). How often will my insurance pay for a new device? Many insurance companies will cover a new device every three to five years. You may also need a new sleep study before your insurance company will authorize the new device. The insurance companies want to make sure that you still need the device and that your current settings are appropriate. Due to weight loss or gain or other changes to your health, you may require a higher or lower pressure setting. How often will my insurance pay for replacement supplies? Hygiene. PAP equipment, such as tubing and masks, can get germy over time. Replace regularly to keep your machine sanitary. Effectiveness. It is vital that your equipment be replaced regularly so that it functions properly. For instance, as masks age, they can crack or stretch, causing irritation and leaks. Comfort. Old equipment, especially masks and cushions, can irritate your face and lead to lack of compliance. Certain supplies need be replaced anywhere from every two weeks to every six months. 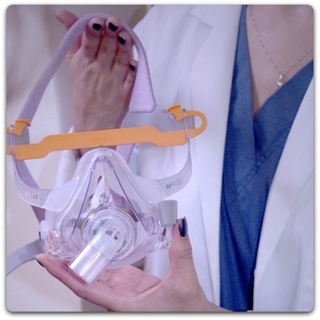 Generally, insurance companies will authorize replacement of CPAP masks, tubing and filters every 90 days. Many insurance plans follow the guidelines from Medicare for regular replacement of supplies. You can review the guidelines online at http://oig.hhs.gov/oei/reports/oei-07-12-00250.pdf. Can I pay cash for my CPAP? Of course! Most providers (like us) offer cash rates for PAP devices and replacement supplies. You may save money and you will definitely save the hassle of dealing with your insurance company. A prescription from your physician and recent sleep study report are still required even for cash purchases. Do you need a CPAP? We’re contracted with all major PPOs, government insurances and many HMOs. See a full list of insurances here. Contact us to schedule a face-to-face set-up today! Should I Pay Cash for my CPAP Machine and Supplies? Hi Doris. If your physician would like to see your compliance data (or it’s required by your insurance company) you will need either a data card or a CPAP with a wireless modem. Once the four months of rental is over and we purchase the machine, do they still need to track the data over wireless as the machine is technically now ours? Our can we disable that feature? I got a letter from my insurance saying that my request for coverage of services has been authorized. 7 monthly rental units. Then it says 10 months. Does this mean that I was compliant with the usage hours? Am I in the clear to keep the machine? I have a situation where I had to transition insurance providers in the midst of my installment-to-own plan. With Cigna it was pay 6 months of installments (and ensure compliance) to own the device thereafter. With Blueshield of CA now, Apria has restarted the installment clock and now says they will bill 10 months of installments after which it is still considered a rental but no charges are due. I’m stuck between Apria & blueshield. Any suggestions on how I approach this ? I entered CPAP from dme 13 month. After 10 months Ichanged Ins co.